Tensions were high in mid-November when five of China’s biggest film distributors banded together to demand an increase in their shares of box office revenues from 43 percent to 45 percent. The five companies—China Film Group, Huayi Brothers Media Group, Bona Film Group, Stellar Mega Films, and Enlight Pictures—told theaters that if they didn’t get their way they would immediately start withholding the releases of their blockbuster movies, including Back to 1942 and Jackie Chan’s China Zodiac, both of which are expected to be major holiday season hits. The five film distribution companies failed to follow the rules; without any attempt at consultation, they simply went ahead and gave the theaters an ultiimatum. The five film companies failed to consider that the industry’s current revenue split has been formed over an extensive period of trial and error and therefore any change in pattern would require adequate preparation. The five film distribution companies only took into consideration their own interests, without considering the challenges faced by theater operators. Most theaters are unprofitable due to the exorbitant rents they must pay their landlords. The distributors failed to use the correct method to address their grievance. They could have easily taken their request for a raise in revenue shares to China’s Movie Special Funds and apply for the increase in rates there. The distributors exchanged friendship for profit. China’s movie industry has always supported these five major players in film distribution. However, their actions showed how they have seemingly left behind their integrity when the temptation of personal gain showed its face. Note that most of these objections are moral and ethical ones, not legal arguments. It’s an interesting example of how business operates in a country like China, where contractual obligations are usually less important than relational ones. 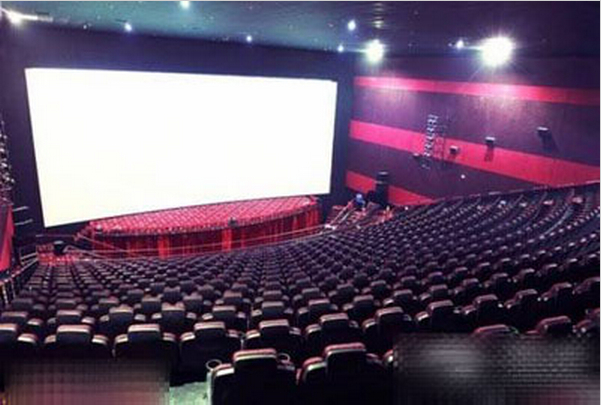 If at least 50 percent of a theater chain’s total annual box office gross is earned from domestic films, 100 percent of fees paid during the year by the theater chain to the NFDFMC (a straight 5 percent of every RMB of ticket sales) will be reimbursed to the theater chain. If the percentage of box office earned from domestic films is between 45 percent and 50 percent, the NFDFMC will reimburse 80 percent of the fees a theater has paid to it. If the percentage is below 45 percent, but the domestic film revenue is still more than last year’s, the NFDFMC will reimbursed 50 percent of the fees. Both sides were apparently satisfied with this solution, and the show will go on. China’s theaters will continue to run films from the five distributors, and Back to 1942 will unspool on the 29th. Having witnessed an endless string of financial shenanigans in China’s movie business, I can’t help feeling that this whole dispute was staged as a ploy to justify an end result that undeniably favors domestic films over imported ones. After all, China’s film regulators have for years twisted and strained to get around the WTO rules, and have often simply reneged on their legal obligations, in order to keep foreign films’ revenues below a 50 percent aggregate share of the box office. With the attractive NFDFMC bonuses to tempt them, it’s hard to imagine that any theater chain in China will ever again submit an annual report with a domestic film box office share of less than 50 percent. The new rules give them powerful incentive to under-report the grosses of the foreign films they exhibit (if they aren’t already doing so) in order to maintain the desired balance and win their juicy year-end spoils. 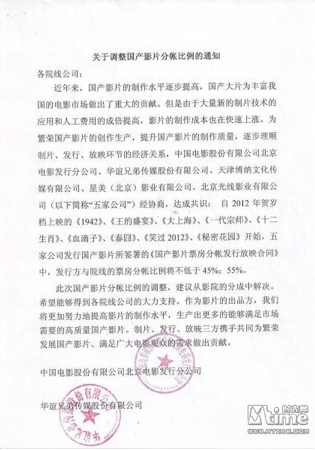 As if this shift against the interests of foreign distributors wasn’t injury enough, I’m also hearing rumors that SARFT is planning to find ways to roll back the 25 percent share it pays foreign films to a somewhat lower rate. If you’ve heard anything about this please write me at the email address below. This entry was posted in General News, Opinion and tagged Back to 1942, Bona Film Group, China Film Group, Chinese Zodiac, Enlight Pictures, Feng Xiaogang, Huayi Brothers Media Group, Jackie Chan, National Film Development Funds Management Committee, NFDFMC, Rob Cain, Robert Cain, SARFT, Stellar Mega Films by chinafilmbiz. Bookmark the permalink. I know that Japan, Korea, India, Turkey and Egypt have also a good market share for their domestic films, do they also have protection rules to help them achieve such market share ? The last graph caught my attention, in particular. The rest reads like a redux of the same friction of about a year ago, which I take as primarily a local issue, though I suppose with some potential to back up to affect the US studios. With respect the 25% rentals: The US-China Film Agreement is pretty clear on that point, and how the share is figured, so I don’t see (off the top of my head) how SARFT could roll that back — and any such attempt will not be welcomed, and fought — vigorously.